Definition: Sl st is the crochet abbreviation for "slip stitch." This is a very basic crochet stitch. It is used to end rounds in crochet projects. You can use it as a project edging. Sometimes it is used to join projects. Worked on the surface of a crochet project, it can look like embroidery. Slip stitch can even be used to create entire projects, although that isn't as common as the other options for utilizing the stitch. On rare occasions, you might also see it abbreviated slip st.
Insert crochet hook into stitch. As you can see, this is almost like a single crochet stitch. However, you don't do the extra yarn over that you would do if this were single crochet. Therefore, slip stitch is shorter than single crochet. In fact, this is a very short stitch. Therefore, one way that you can use it is to move from one part of a project over to another part without adding height to the project. There are many other ways to use crochet slip stitch. 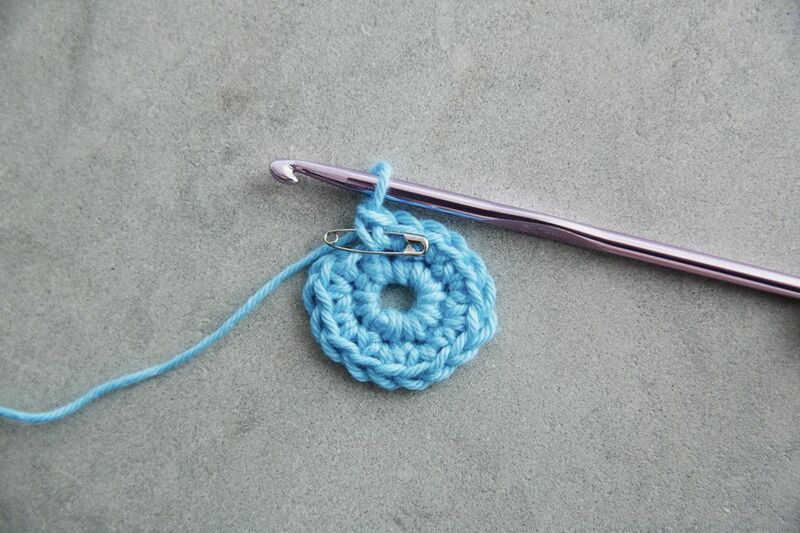 One of the most common times that you will see it is when you crochet a circle or work in the round. This creates a circle. You can also use a slip stitch to end each round of a circle. You begin the round with a stitch of whatever height the pattern calls for. Then you work all the way around, eventually coming back to that stitch. In order to complete the round, you need to join the final stitch to that first stitch. Therefore, you use a single crochet stitch to do that. Following the sl st instructions, you would insert your hook into the top of the ch 3, yarn over and pull through to close the round. Then you could begin the next round of the project. Crochet sl st is actually a great edging for many projects. You simply work one slip stitch into each round of the project. It gives a flat, finished edge to the design. It particularly complements single crochet projects. However, it works in many other situations as well. Oftentimes we crochet motifs, then we have to join them at the end to complete the project. For example, you might make a whole bunch of granny squares, then join them together to create a blanket. There are myriad ways to join crochet motifs. One option is a sl st join. You can also use sl st to add embroidery-style details to crochet fabric. For example, you could crochet a scarf in double crochet stitches. Then you could use surface crochet techniques to slip stitch a heart onto the top of that scarf. Sl st is worked slightly differently on the surface of the fabric, but the basic idea (insert hook, yarn over, pull through) is the same. Most people don't opt to make an entire project using crochet slip stitch. In fact, many people call this a crochet technique instead of a crochet stitch. The short height means that it takes a lot of yarn and goes very slowly if you do try to make a whole project using sl st. Additionally, the limited stitch height makes it hard to see exactly where to put the next stitch. Nevertheless, it is possible to crochet fabric using sl st. This is often called shepherd's knitting or Bosnian crochet, so look for those terms if you are seeking patterns that use this technique.